And after years of her asking me to try yoga with her, this summer I decided to give it a crack. With the full expectation that my bits wouldn’t bend the right way and I’d fall over an awful lot. We went two more times. And you know what? I liked it. Then I discovered that Beer Yoga exists. 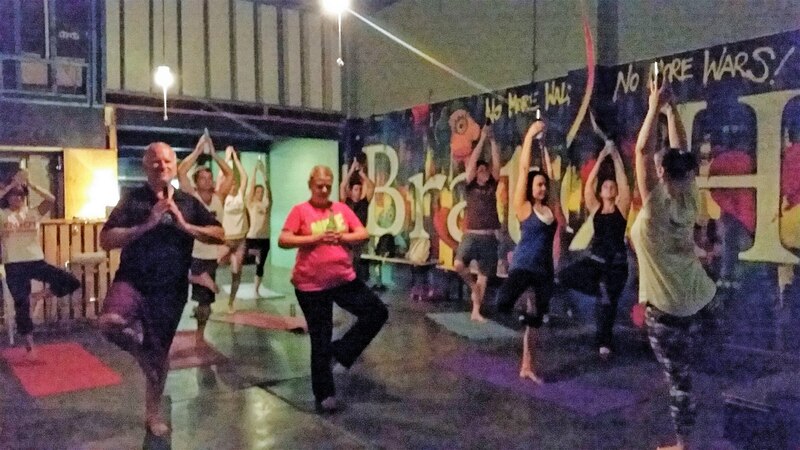 We showed up to The Brat Cave, a new small bar in Woolloongabba, where people were milling around, chatting with yoga mats under their arms. I borrowed one from behind the bar, and started to glance around nonchalantly to see if anyone had a beer yet. Do we get our beer before the class? Or after? At two minutes before go-time, everyone grabbed a beer from the bar. I went for a tinnie of Mountain Goat Fancy Pants in a Brat Haus stubby cooler (that’s ‘beer cozy’ to some of you) and took my place in front of the instructor Sammy. At which point the above meditation kicked off the class, and I realised this is DEFINITELY my kind of yoga. Beer is always at my heart centre. “Reach forward and scoop up your beer. Now inhale deeply as you lift it above your head. 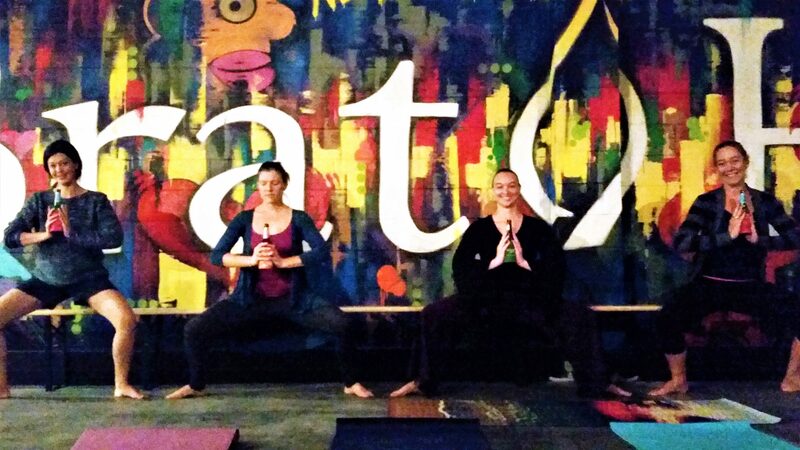 Tree pose – a difficult position to balance in, but an easy position to drink in. Every yoga class ends with a pose called Shivasana… which is just lying on your back. I’m excellent at that pose. Yoga combines exercise and relaxation, and while I’m new to exercise, I’m a long-time pro at relaxation. And you know, I think this is one of the reasons beer and yoga go so well together. Yoga’s a relaxation technique, and newcomers often feel self-conscious trying some of the weird positions. Beer’s a relaxant, and lowers your inhibitions. “Personally, I haven’t done any exercise since 1998 up until 2016,” said Ben from The Brat Cave. He fell in love with the concept of Beer Yoga when he heard about it happening in Berlin, and decided Brisbane needed it. And for this, Ben found the ideal yoga teacher—Samantha Ball. Samantha Ball – Beer Yogi. She started practising yoga because she was stressed out from her 9 to 5 government job. And Sammy does a great job of bringing the two together seamlessly. She even managed to get her husband, who refuses to do yoga, to test out the Beer Yoga moves before the first class… beer included, of course. I’ve only yoga’d four times so far. I’m still quite wobbly, and I even rolled backwards over my head once, which I’m pretty sure isn’t meant to happen. But I’ve already noticed myself getting better at some of the moves—I’m getting stronger and bendier, which must be a good thing. So maybe this ‘exercise’ thing isn’t so bad. And a cold tinnie certainly gives me incentive to show up, which I plan to do again as soon as Beer Yoga starts back up in February. Yoga classes generally end with thanking yourself and/or each other and/or ‘the universe’, or something of the like. At the end of Beer Yoga, we thanked the beer. Which is pretty much what the craft beer movement is about, isn’t it? 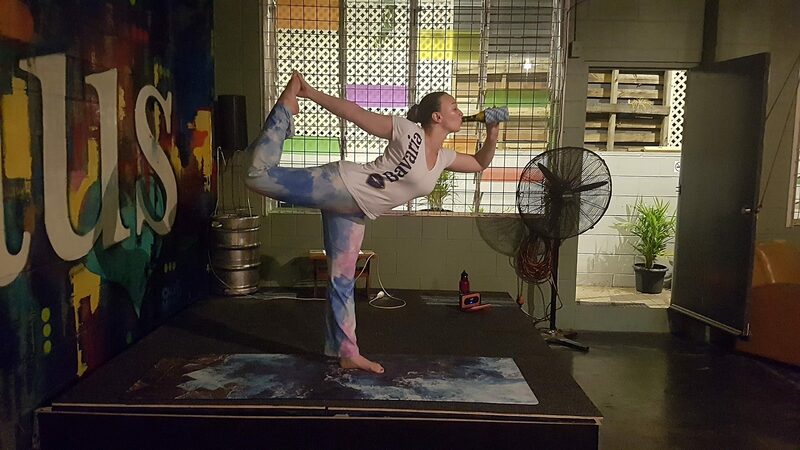 Would you be willing to have a crack at Beer Yoga? Let me know in the comments. ← Summer in Hobart means winter beers.